I’m sharing the ways I’ve failed this year, and how I’ve changed my mindset to think outside the failure box (and you can, too) in today’s vulnerable episode. I’m also breaking down my new course, Actually Healthy and extending an invitation for you to join in 2018. We’re breaking down top episodes from season one of The Feel Good Effect podcast, plus I’m sharing what I’ve learned from my first year of podcasting, plus a never-before-heard clip from before the podcast went live. We’re also diving into my new course, Actually Healthy! Today we’re talking with Laila Ali, world-class athlete, fitness & wellness expert, TV host, cooking enthusiast, founder of the Laila Ali Lifestyle Brand, and mother of two. Laila is sharing how she got into boxing, her transition into fitness & wellness, finding balance, her philosophy on preparation, and persistence, plus her new book, Food For Life. The youngest daughter of late beloved global icon and humanitarian, Muhammad Ali, she is a two-time hall of famer and four-time undefeated boxing world champion, whose stellar record includes 24 wins (21 of which were “knockouts”). Laila is most excited about her forthcoming cookbook, “Food For Life: Delicious & Healthy Comfort Food From My Table To Yours!” being released January 23, 2018. A major source of the inspiration for Laila writing this particular cookbook was her desire to show people how they could enjoy healthier and more nutritious versions of their favorite foods without having to compromise taste. We’re diving into body image, redefining success, and finding happiness in the digital media age today with Kathryn Budig. Kathryn’s journey to yoga and how her relationship with the practice has changed over time. On resisting labels and living outside of a definable box. How to redefine successful and move away from external validation to measure self-worth. The difference between success and happiness. How to look at your core values and evaluate how your life matches your core values. Loving who you are right now in all aspects. Not indulging in negative self-talk and understanding the complexities of body image. Avoiding the comparison trap, in particular comparing yourself to previous versions of yourself. With over a decade of experience in her field, Budig served as the yoga editor to Women’s Health magazine for five years, contributed recipes and sat on the Yahoo Health Advisory Board, and regularly contributes to Yoga Journal, The New Potato, and MindBodyGreen. She is the creator of the Aim True Yoga DVD produced by Gaiam, author of The Women’s Health Big Book of Yoga and Aim True. Melissa Hartwig is co-founder of the Whole30 program, and four-time New York Times bestselling author. In today’s episode we dive into details about the Whole30, Melissa’s take on dieting, and she explains all about the lesson of the lamp. Read on for more on Melissa's interview, and scroll to the bottom to listen to the podcast. Today’s guest is kind of a big deal. Melissa Hartwig is a cofounder of the Whole30 program, a certified sports nutritionist specializing in helping people change their relationship with food, and a 4-time New York Times bestselling author. In this interview, we will go into depth about the Whole30 program and Melissa’s two new books, a cookbook, “The Whole30 Fast & Easy Cookbook”, and a journal, “Whole30 Day by Day”. We will also dive into how she uses her personal social media to speak her truth and the lesson of the lamp. The Whole30 is essentially pushing the reset button with your health, habits, and relationship with food. It is not a diet, a weight loss plan, or quick fix. It is about helping you figure out how the foods you eat affect your craving, metabolism, digestion, and immune system. It’s a 30 day self experiment to figure out which foods work for you, so that you can create the perfect diet for you for the long term. It’s an experiment in that it’s an individual journey. The diet industry tends to have two modes of thought: either that food and diets are one-size-fits-all (eat this, don’t eat that and you should succeed) or that it’s not, that it is actually an individual need and experience. But how do we know what we need as an individual? So, Whole30 helps bridge that gap saying that it’s not one-size-fits-all, while giving the structure to help you figure out what works for your individual self in this 30 day experiment. The Whole30 program gets some criticism that it’s a diet program, too. People tend to think of “diet” as a caloric restriction program to focus on weight loss, relying heavily on will power, and then it just ends, leaving people primed for a rebound. The Whole30 is different; it’s about changing our approach and connection to food. Depending on health history, diet, activity, and stress levels, the experience of switching to the Whole30 will differ. However, it is often a relatively big change, especially for the first 10 days. During this period, there are physiological changes taking place (consuming less sugar and processed carbs, but more nutrient dense foods) as well as psychological changes (relying less on comfort foods). These changes are hard, but often by week 2 most of these negative effects are over, and energy, mood, and self confidence are back up. There is so much guilt and shame attached to our food choices. The Whole30 supportive resources and community help motivate people from a place of understanding. Finishing the program may take more than one try! This is something new and hard, but there is a huge emphasis on support from the community. This book, “Food Freedom Forever: Letting Go of Bad Habits, Guilt, and Anxiety Around Food”, is about how to keep up healthy habits. After hearing community feedback on struggling to keep it up after the 30 days end, Melissa wrote this book to help turn healthy habits learned from the Whole30 into a lifestyle that works for you. The struggle is almost all psychological, emotional, and habitual. From research in habits, willpower and change, Melissa provides practical application of these skills. In the example of this common dieting dialogue, “you need to just decide if this indulgence is worth it”, Melissa offers in the moment strategies on how to figure out if it is worth it for you. It’s about changing your emotional relationship with food in a healthy way that will become integrated into your mindset over time. The Whole30 actually started as a program for young, crossfitters and expanded into a much larger, more diverse community that needed a softer approach to changing your relationship with food. It has been refined since, and the Whole30 program tells you exactly what to eat, what not to eat, provides guidelines on how much to eat, for a 30 days period. People like the effective structure in this changing process. Each step takes away some of the structure to help ease people out of the program and into their lives. At the end there is a Reintroduction Period when old food groups are reintroduced, but you're in charge, maintaining some of the structure. Even afterwards, during Food Freedom, although it is on your own at that point, Whole30 provides a plan to integrate healthy habits into your life. The 4 tendencies come from Gretchen Rubin; you can hear her talk about them in her interview with the Feel Good Effect Podcast. There is language in the Whole30 for all 4 of the tendencies to structurally support all 4 types relating to habit. Upholders just need to be given instructions and the Whole30 gives an explicit plan for upholders to follow. Obligers need accountability, so the Whole30 has a range of coaches, forums, and social media buddies to help maintain this support. Rebels often feel pressured, so the Whole30 language includes intentional pieces to lessen pressures. Questioners want to know “why”, so Melissa wrote an entire book, “It Starts With Food”, to provide the science behind why we do this. “The Whole30 Fast & Easy Cookbook” is a cookbook with sheet pan, slow cooker, no cook, or simple cook recipes, great for gluten-free, dairy-free, reduced sugar, and soy-free diets, with whole food, healthy and satisfying meals. After taking away so many foods for a program, sometimes it’s hard to imagine what’s left on the plate; this book helps open up your palette. “Whole30 Day by Day” is a day by day companion guide to your Whole30 experience. After watching over 1 million people go through the Whole30 program, Melissa has good idea of what each day will look like. This guide is part manual, part reflection, and every day has motivation, tips and tricks, resources, FAQ’s answered, and a guided reflection to help plan for the day. Habit research is built into each of these daily steps to help make these habits stick. Whole30 coaching is also a growing community. When surveyed, Melissa found that 75% of the Whole30 community were doing it alone. An online community doesn't give in-person social support that studies show are so important in habit change. Whole30 coaches are part of local communities, experts in Whole30 program, there to provide support and accountability to help finish the program. Even though she is the face of Whole30, their social media feed is exclusive to Whole30. Melissa’s personal social media, which is self-run, is where she shares her other interests with people who want to connect with her. The lesson of the lamp is meant to help people who are struggling with feeling like they are at the mercy of other people's opinions. For people who are really brought up by compliments but really dragged down by criticism. If you look at a lamp, and you say “I don't like that lamp”, it doesn't say anything about the nature of the lamp. It does, however, say something about how you are choosing to experience the lamp. When you know how you really are, it won’t weigh you down when you hear criticism. Your own self acceptance is what is important. Lesson of the lamp helps you remember: this isn't about me it's about them. And it doesn't matter what someone else thinks. The second lesson of the lamp, is that you can't build compliments into your self worth, either. Criticisms aren't about you, and compliments are the same way. Self worth cannot be built on other people’s compliments, in the same way criticism can’t be either. How are you going through your life? How are other people's opinions affecting your overall opinion of yourself and your overall self worth? Melissa has been more open and candid on social media than in prior years. Originally, she tried to present a perfect life on social media, although it didn’t match her reality. After ending her marriage, she shed her online imposture and felt better about how she presented herself. She wanted to take it to the next level, becoming slightly uncomfortable in her vulnerability. Melissa uses instagram for “mini therapy sessions”, since she cant take it back after processing and posting online. It’s good practice for sharing vulnerably. Sometimes it’s hard to be real and vulnerable, but it’s also hard to pretend that something there isn't. Melissa’s next adventure is a book tour. She’s also continuing to grow and develop coaching communities, and (maybe!) in the early stages of developing a podcast with Gretchen Rubin. To connect with Melissa, she’s on Facebook but is most active on Instagram. “Being in a place where your inner integrity is in line with your outer actions. So you feel like you are really… ‘belonging to yourself’. Melissa Hartwig is a Certified Sports Nutritionist who specializes in helping people change their relationship with food and create life-long, healthy habits. She has been featured by Dr. Oz, Good Morning America, the New York Times, the Wall Street Journal, Details, Shape, Outside, and SELF, and ranked #27 on Greatists Top 100 Most Influential People in Health and Fitness in 2017. Melissa has presented more than 150 health and nutrition seminars worldwide, and is a prominent keynote speaker on social media and branding, health trends, and entrepreneurship. We’re diving into a Feel Good Effect success story today, as we chat with Ali Edwards from aliedwards.com. We talk about Ali’s wellness story, how she balances taking care of herself as a working mama of a blended family of seven, and how she’s used lessons taken from the Feel Good Effect to find real health in real life. Ali Edwards's passion resides in that very special place where the stories and images of life intersect. Her work includes teaching, writing, photography, and memory keeping product design. Learn more about her intentional memory keeping projects and products at http://www.aliedwards.com. Ali’s wellness story, what worked and what didn’t. What’s still challenging on a day to day basis. How Ali found help with her anxiety and depression. Her philosophy on food and feeding a family of seven. Her approach to movement and finding what works for her. Ali’s go-to Feel Good Effect podcast episodes. We’re taking a deep dive the fundamental problem of retouching in media, why narrowing the definition of beauty is not healthy, how to replace lies with truth, and the upcoming documentary, self(i.e. ), with Sarah Dubbeldam, CEO of DARLING Media and Editor-in-Chief of DARLING Magazine. Sarah Dubbeldam is founder of DARLING, a multi-media company that is positively redefining female-driven digital, social and print content. She serves as CEO of DARLING Media and Editor-in-Chief of DARLING Magazine. After graduating from Concordia University, Sarah was signed by one of the world’s top modeling agencies. Although her modeling career was met with success through national campaigns, after a few years she was fed up with feeling insecure and depressed, questioning what she was doing with her life. Sarah put her dissatisfaction into action and over coffee with her best friend Kelli, came up with the idea of launching DARLING, a magazine that broadened the ideal of “beauty” with an authentic and elevated conversation for women. The goal: creating media that matters. Five years after first developing the concept, Sarah turned to Kickstarter in 2012 to get the print magazine off the ground. Since then the company has grown into different verticals such as video, online, social media and events and has become a movement to build women’s self-esteem. DARLING is the only women’s magazine that does not retouch women’s skin or bodies and seeks to represent a wide range of sizes, ages and ethnicities. The cultural phenomenon Sarah has created can be seen in the hashtags #thatsdarling, #darlingmovement and #darlingweekend that have been used more than 15 million times on social media. The DARLING founding story, and how the mission statement came to be. The decision to not retouch images in the magazine. The difference between filters and retouching. Sarah’s definition of perfectionism and the ideal of beauty throughout the years. The problem with narrowing the idea of beauty. Bringing awareness to self-critical thoughts and sharing these thoughts with a supportive community. Learning to have healthy thought patterns is what it really means to be healthy. We’re taking a deep dive into meal planning this week. From how to make meal planning work in real life, common mistakes, specific mindset strategies, and action steps, this episode is packed with information to help you meal plan (even if you hate the idea right now)! Ready to simplify? I made you a free cheatsheet! There is no such thing as perfect meal planning. Let go of unrealistic expectations and rigid plans in favor of simplicity, and work within the context of your real life. Action Step: Can you think of a specific example when perfect meal planning or following a rigid plan kept you from meal planning? If so, how can you reset expectations and try again? Keeping in mind why you are meal planning and cooking at home can help keep you on track and motivated over time. If your why includes goals for the future, see if you can add a few that are more immediate. Action Step: Make a list of why you want to meal plan and cook at home. Then add a few immediate outcomes to the list. Complicated recipes and long ingredient lists are a sure why to burnout and ditch meal planning altogether. Instead, try simplifying. Think of recipes in terms of the Essential Six, and Meal Map instead of meal planning. Simplifying the process will allow you to know what you need at the grocery store and then have ingredients on hand to throw together meals in minutes. 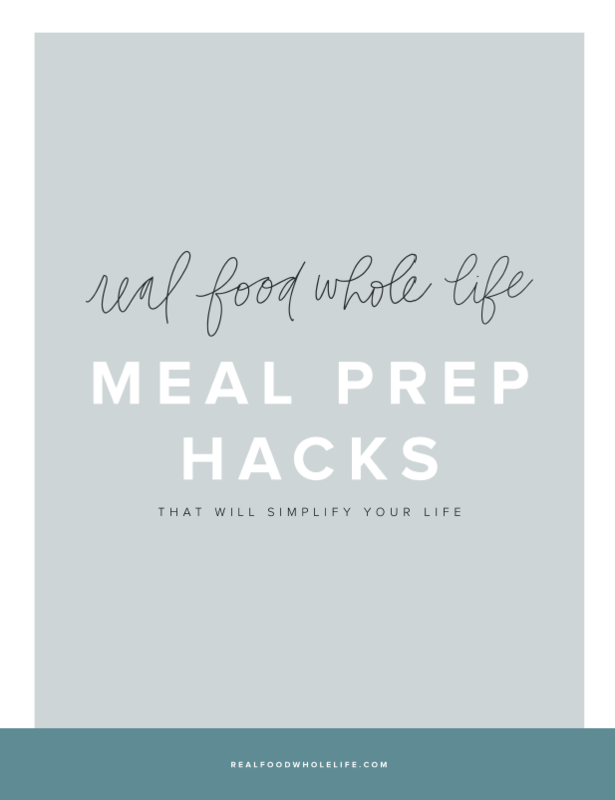 Action Step: Think about ways you can simplify meal planning. Try adopting the Essential Six and Meal Mapping approach and see if it makes things easier. Take meal planning off the dreaded chore list and move it into the self-care category. Pour yourself a cup of tea or glass of wine, put on some good music, and take a few moments to prepare for the week in comfort. Action Step: Brainstorm a few ways you can make the process of meal planning more enjoyable and nurturing. There is no rule you need to do everything yourself. Invite others in your life to help with the process, whether it’s picking up groceries or taking something off your plate. Action Step: Think about ways you can invite help when it comes to meal planning. Then reach out and ask! In the ideal world we’d all have every meal planned and ingredients on hand for effortless cooking. Since the ideal isn’t always possible, just start with something. Plan one dinner. Batch cook one recipe. Start small. Then see how far you can go. Action Step: How can you adopt the anything is better than nothing mentality this week? You don’t need to wait for the ideal, start now, start small, and enjoy the ride. In this episode, we’re talking with Lisa Merkle, a self described yogi, event designer, and cancer survivor, about her life before cancer, how she navigated both western and eastern approaches to fighting the disease and healing her body, and what she learned through the process. Diagnosed with cancer in July of 2016 and recently resurfacing from treatment, Lisa is moved to share lessons endured in an effort to educate and inspire others on the topic of cancer prevention and awareness. As a certified yoga teacher, Holistic Health Coach, and with a background in photo and event production, Lisa launched an event and lifestyle design studio with a focus on serving clients associating with health and wellness trends. She recently relocated to Miami after 17 years in New York City, with sights set on developing an Urban Farm in Overtown Miami: a food desert and historically underserved community in downtown Miami. Prior to launching her own business, she spent a decade as Studio Manager at the photography studio of photographer Bruce Weber. Living the wellness lifestyle before cancer. Her symptoms and experience with treatment prior to the diagnosis. Lisa’s cancer diagnosis, and the decisions she faced going into treatment. The bias she held against western medicine, and how she worked with both eastern and western practitioners to address her illness. Why the antithesis to polarization is inclusivity, to connect and to create a dialog. The healing practices she implemented during treatment and recovery. Why she chooses love over fear. Lisa’s next project in Miami. In this episode we’re talking with Kate Fagan, author of the book, What Made Maddy Run: The Secret Struggles and Tragic Death of an All-American Teen. We unpack the themes of perfectionism, the effects of social media on our brains, difficult transitions, and mental health. And we explore how healthy is driving satisfaction from activities and engagement not dependent on outside validation. Unpacking the themes of perfectionism, the effects of social media on our brains, difficult transitions, and mental health. How we seem to need one box for everything and how that can be problematic in talking about mental health. How filters played a role in Maddy’s life, and how they may be playing a role in all of our lives. How much photographic information we are consuming and the possible impact on our brains. The inability to see that everyone else’s social feeds were filtered, too. The problem with filtering in and filtering out. Social isolation and social media. The difference between connectivity and true social connection. The ways that the digital medium can cloud a real emotional state. Real conversations are messy and lack control vs. digital interactions. Connecting one human to another is asking follow up questions and staying in the relationship through the hard questions. If you think you are alone in your feelings it may be difficult to share your experience and ask for help. The transition to college and the challenges this experience can bring. “I know I’m supposed to feel like the lucky chosen few, but all I feel is overwhelm.” This can be a really difficult mental battle. Why checking boxes and achieving will never be enough when it’s in the absence of true joy, knowing who you are and what makes you happy. Finding joy and peace with things that have nothing to do with external validation. Healthy is driving a majority percentage of satisfaction from activities and engagement not dependent on outside validation. Jon Acuff is the New York Times-bestselling author of six books including his most recent, Finish. He's helped some of the biggest brands in the world tell their story, spoken to hundreds of thousands of people at companies such as Microsoft, Nissan and Comedy Central, and been featured regularly on national media. Why Jon followed up his book Start with his current book, Finish to answer the question of how to actually reach your goals. Shining light on why the middle is so hard. Why perfectionism is one of the biggest hurdles to success. What to do on the day after perfect, when things haven’t worked out. Escaping all-or-nothing thinking when it comes to goals. Reconciling the perceived definition of perfectionism with how it manifests in real life. The significance of day 2 and day 13 in reaching your goals. How cutting goals in half can help you succeed in the long run. Secret rules and why they are keeping you from your goals. Why being kind to yourself is the key to success. How self-awareness leads to understanding secret rules and moving beyond them. The importance of fun and how it contributes to success. Why you can’t do it all, shouldn’t do it all, and how to let things go. Shame is pretending you can do it all. Using perfectionism to avoid the true work. Being honest about your own failures and not painting a perfect picture of yourself to the people around you. Remember one size doesn’t fit all. Always be editing, always be tweaking, always be curious. A health goal isn’t turning you into a different person. A health goal is allowing you to celebrate you you already are even more. We are diving into The Four Tendencies with Gretchen Rubin, and why knowing yourself is the way to a happy, healthy life. She’s the author of many books, including the blockbuster New York Times bestsellers Better Than Before and The Happiness Project. A member of Oprah’s SuperSoul 100, Rubin has an enormous following, in print and online; her books have sold almost three million copies worldwide, and she has a highly ranked, award-winning podcast, Happier with Gretchen Rubin. How she left a successful law career for writing. Why it took Gretchen 10 years to become an overnight success. The origin story of the Happiness Project, and why she focused on the practical daily life activities for health and happiness. What “Be Gretchen” means, and why the only way to build a happy, healthy, creative, efficient life is to base it on the foundation of our own nature, our own values, our own interests, our own temperament. There is no magic one-size fits all solution. We are mostly alike but the differences are so important. Sometimes things work, sometimes they don’t and it’s not your fault. Why it’s so hard to know yourself. There’s the way we wish we were, the way other people wish we were, and our assumptions about what people are like. Using the laws of distinction to describe our differences. What did you love to do when you were 10 years old, what do you lie about (which means there’s a disconnect between you life and your values), who do you envy? Shining a spotlight on hidden patterns and lending a vocabulary. The Four Tendencies and how you respond to outer and inner expectations. The difference between Upholder, Questioners, Obligers, Rebels. Diving into the challenges and positives of each tendency. Why it doesn’t work to try to change your tendency. Why “should” is a trigger. It’s only what I can do, what I will do, and what works for me. In this episode we dive into the true meaning of wellness with Colleen Wachob, the Founding Partner and Chief Brand Officer at mindbodygreen, one of the biggest brands in wellness. Colleen graduated from Stanford University with degrees in International Relations and Spanish, and spent ten years working at Fortune 500 companies including Gap, Walmart and Amazon. She now lives in Brooklyn, New York with her husband, mbg founder, Jason Wachob, and daughter Ellie. How she switched careers to find health and connect with her passion in the wellness world. How a health scare led to a significant life changes and served as the catalyst to leave her traditional career path. Why wellness is living a complete and fulfilling life. That’s a life of connections with self, with your family, with your community and your environment. Why wellness is a journey with no no clear destination. How the actual practice of wellness is progress. The mbg definition of wellness that requires looking at the connections across the pillars of wellness: physically, mentally, emotionally, spiritually and environmentally. Why the wellness industry runs the risk of turning narcissistic and obsessive. Clarifying the distinctions between science-backed wellness trends. Why there isn’t one answer--and how to tune into you when it comes to navigating the wellness space. The Feel Good test: Does this make you feel good?. Wellness has to become so much more accessible. Making it part of everyday life. Navigating big life transitions from the corporate world to a start-up and Colleen’s new role as a mother. Intentionally disconnecting from social media and connecting with family to create balance and balance. The upcoming mbg Revitalize conference. In this episode, we’re chatting about ditching extremes, setting boundaries, listening in and finding joy with Davida Kuglemass from the Healthy Maven. Davida Kugelmass is the creator behind The Healthy Maven, a multi-channel health and wellness platform dedicated to making healthy living easier and sustainable. Davida’s content is diverse, ranging from recipes, to travel, to self-care with a focus on how to live healthfully, rather than living for your health. How to take what works for you (and ditch the rest). Overcoming an exercise addiction by taking a break and finding joy in movement. Giving yourself permission to explore different options for healthy living. Quitting the exhausted, hungry, guilty, frustrated cycle when it comes to food and exercise. Why health is so much more than your pant size. Letting go of compulsive exercise and leaning into intuitive movement. How to really listen to your body and give yourself permission to get what you actually need. Davida’s self-nourishing morning and evening routine. Balance is nourishing your body to feel good and that it changes from day to day. In this episode we’re diving into developing healthy habits from day one, creating a balanced food philosophy, and raising children who listen to their bodies while still maintaining expectations around healthy eating with Catherine McCord of Weelicious and One Potato. Catherine, mom to Kenya (9), Chloe (7) and Gemma (2), created Weelicious.com as a platform to show parents around the world how easy and beneficial it is to expose children to wholesome, delicious homemade food. She is the author of multiple cookbooks, has a monthly “Snack Mom” column in Parenting Magazine, and has appeared in People, Self, Real Simple, the Today Show, among others. In 2016, she founded One Potato, an organic family friendly meal delivery kit offering three meals a week that take around 30 minutes or less to prepare. How to create good eaters from day one. Catherine’s philosophy about one family, one meal (and avoiding becoming a short-order cook). Why everything leads to the next step. Creating a balanced food philosophy of healthy nutritional meals with nutrient density (fruits, veggies, protein, fats and carbs) and also allowing for treats. Raising children who listen to their bodies while creating expectations around healthy eating. The Smoothie Project chart and how to create a nutrient-dense smoothie each day. Creating structure while also allowing choice and freedom for children. Incrementally introducing vegetables and fruits to get your child used to healthy options. Knowing your child and shaping your approach based on their needs while holding the line on second meals. Creating a list of the 10 foods you know your child loves and using it to build lunches around with some variations. How Catherine created One Potato organic family meal delivery service. The challenges of being an entrepreneur and balancing work and family. Why you can’t do it all and letting things go without beating yourself up and why everything is a tradeoff. Catherine’s definition of balance: feeling good and taking care of yourself. Enter promo code FEELGOOD25 here for $25 off your first One Potato order. Taesha Butler is the blogger behind the site, The Natural Nurturer. In her journey to health she lost over 70 pounds, and figured out how to feed a partner and child real, healthy food along the way. She is a full-time teacher and mother, and today shares family-friendly real food recipes, clean living tips, and natural parenting ideas. Taesha aims to empower parents and caregivers to raise their families in healthy way that fits into their busy lives, and today is breaking down real food for busy families and how to take care of yourself in the process. Taesha’s weight loss journey and how she lost over 70 pounds. Handling family grief and finding food as a way to heal. Finding a new healthy normal after baby. Keeping an eye on small steps and celebrating small success. Overcoming sheer exhaustion when it comes to incorporating real food and cooking. Using the slow cooker to get dinner on the table (even when exhausted). Letting go what you think dinner is supposed look like, and embracing what is. Transitioning a family to real food by taking baby steps. Leading by example when it comes to real food. Using muffin tin meals and choice to feed your child real food. Putting together a real food lunch box. Living simply and enjoying the little things in life.